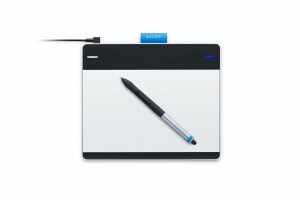 Using a graphics tablet to draw Manga or Anime images or cartoons is certainly popular. People buying products through this site often buy a software package that offers Manga-style workflows and tools to go with their new tablet – so it is no wonder that Wacom have seized upon a chance to make more money and have released the Bamboo Manga graphics tablet. 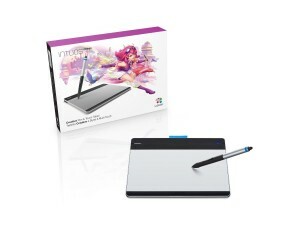 Update: The Bamboo Manga is now known as the Intuos Manga, in line with the recent update to the Wacom range. This latest “pen and touch” capable tablet from Wacom landed on our test lab desk the other day and we took it for a spin. We did not expect anything too different from the standard Bamboo models, which we have reviewed before, but we were keen to use the software packages that were provided. What is so special about the Bamboo Manga? 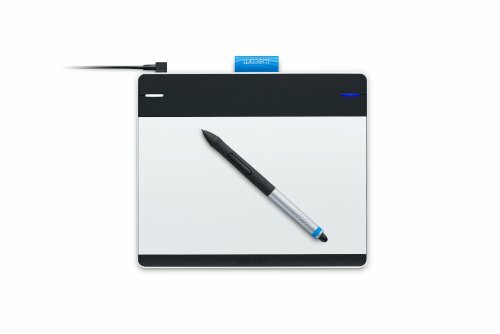 This product is essentially the same as a standard Bamboo pen and touch tablet, but comes with some additional styling and some softwares in the box. Designed to look nicer than your standard black/silver tablet, this neon green edged beauty will appeal to the younger, more Manga-savvy shopper, looking to develop their skills as a Japanese style cartoonist. Aside from the usual array of tools and programs (that most people never use), you also get a bundled copy of the excellent Manga Studio Debut 4 and Anime Studio Debut 8 on the CD. If Adobe did Manga software, these would be their flagship products. Debut 4 is the leading software for creating comics and Studio Debut 8 can be used to create animations and 2D movies – everything you need to become the next Osamu Tezuka! The Manga Studio Debut 4 software allows you to have a vast array of patterns, speech bubbles, halftones and effects at your fingertips to enhance your drawings. If you know Manga – then you need this software to create the best comics. As with all other Wacom tablets, the installation was a breeze and we experienced no problems getting the tablet to work with both our Mac and PC. The provided software packages were also installed with no problems. Multi-touch input allows you to pinch and zoom whilst working. 4 programable access buttons that allow you to select different tools within applications. 1024 levels of pressure sensitivity. Optional wireless adapter to allow you to draw “wires free”. Is the Manga Bamboo a good choice for me? You could just buy a normal Bamboo pen and touch tablet and get hold of the required apps to achieve the same end, but this neat package of technology and software is ideal for those looking to draw Manga style images and cartoons or venture further into animation. As with all Wacom products, the build quality is perfect – they are not the industry leaders in making graphics tablets for nothing! – and the support and drivers for Mac and PC are excellent. If you are a budding digital artist with a bent towards this style of imagery, you could not do much better than this package. The price also makes this tablet accessible to more than just professional digital artists, so you have no excuse not to jump in!